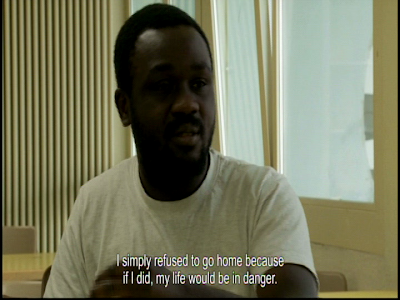 Special Flight (Vol spécial, 2011) by Fernand Melgar documents the inside of the Frambois detention center near Geneva, Switzerland. Frambois is a prison for refugees who are being sent back to their home countries against their wills. Observational footage shows the interactions between staff and would-be asylum seekers. The question of who is a "legitimate" refugee fleeing persecution and danger, and who is an immigrant living illegally in Switzerland is beside the point in Melgar's tightly focused and carefully edited approach. Both the detainees and their keepers are portrayed sympathetically, but the unresolvable bureaucratic randomness create a fluorescent-lit nightmare within the orderly walls of the Frambois facility.